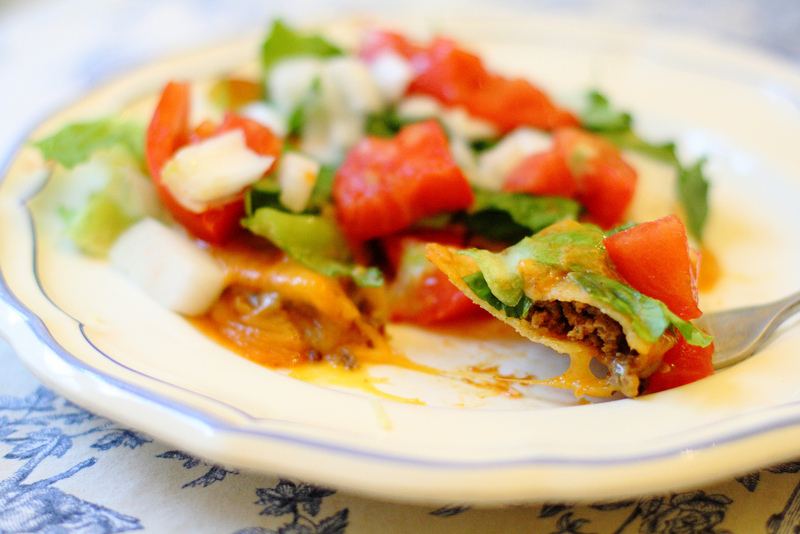 Confession: I don’t think I was particularly enthused about enchiladas until I met my husband. I didn’t dislike them, but I certainly didn’t crave them. Obviously things have changed and I was finally able to convince B to share his finely-tuned recipe with the world. **Here are few options if you have to order it, like we do. In a large, high-sided pan, heat olive oil over medium heat. Add onions and saute until soft, but not browned. Add garlic and cook until fragrant. Add flour, stirring constantly, and heat for 2-3 minutes until golden brown and you have created a light roux. Add water, chile powder, garlic powder, and salt. Bring to a boil. Reduce to a simmer and cook uncovered, stirring occasionally, for 15-20 minutes. Remove sauce from heat. Using a hand-mixer or food processor, puree sauce until smooth. Return to heat, add sugar, and adjust seasoning to taste. Let simmer until slightly thickened. Brown hamburger in skillet with salt and pepper. Fry tortillas in batches in olive oil or vegetable oil until golden, but not crisp. Pat tortillas with paper towels to remove excess oil. To make enchiladas, layer one tortilla with layer of hamburger, ladle sauce, sprinkle cheese, layer another tortilla, add more sauce and cheese – feel free to add as many layers as you want! Heat in microwave until melted. 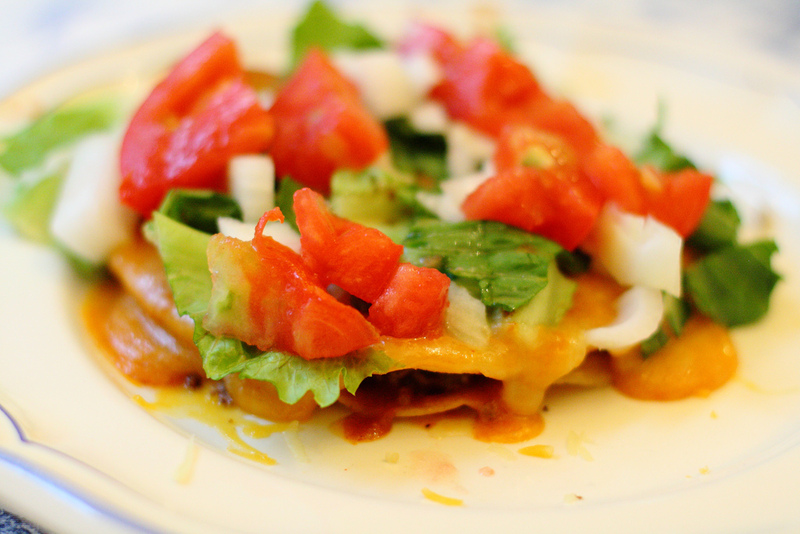 Sprinkle with as much fresh lettuce, tomato, and onion as you desire and enjoy! yummm those look so good! these look great! thanks for sharing!!!!! This looks so good! I get tired of tacos so this is a great alternative. This looks yummy. I can't wait for my next BBQ! That looks incredibly delicious. I heart enchiladas. OMG delish, def making these. I love it when you and B share your recipes. Those look so yummy. I love cooking Mexican food! I'm totally going to try out this recipe! Looks delicious! It looks yummy and sounds simple to make. mmm knew i'd like the post as soon as i saw the title! That was the only thing that scared me from making these. The sauce, my mom who doesn't even deserve to be in the kitchen use to throw tomato sauce with nothing else on them and call them enchiladas. It wasn't under i went out to eat once when i was younger and tasted them and thought okay what was my mother thinking. These look so yummy though! I may have to try these and teach my mom a thing of two hahaha. These look delicious! Definitely going to try them. wow this plate is soo perfect..i'll try it soon! :)i'v seen the other posts and i love your style in wearing girl! These look so good! I love enchiladas!